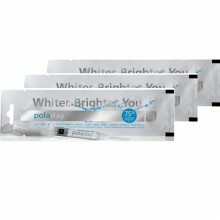 There are many whitening gels available on the market today. Don’t be fooled they are not all the same. Teeth whitening is our passion, and after many years of brightening smiles, we have discovered what is needed to give the best results in the quickest possible time. A lot of science has been put into the development of the world acclaimed whitening gel we use – at the end of the day, it’s the quality of the gel that will give the best results. That’s why we only use POLA. 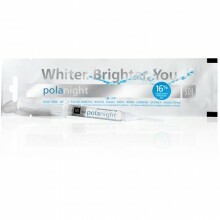 Pola teeth whitening formulae has a high viscosity and neutral pH ensuring the greatest patient comfort. The unique blend of soothers, conditioners and high water content assist in reducing sensitivity. 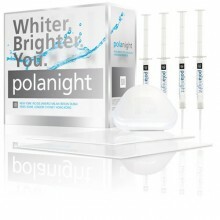 Minimizes plaque formation and enhances remineralisation to further reduce sensitivity. 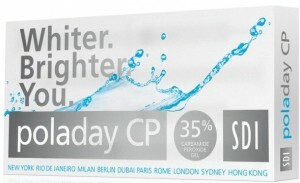 Reduces dehydration of the enamel and decreases tooth sensitivity. Reduces the drying effect of the gel and in turn sensitivity. Ensures the can be easily and securely placed into the custom tray for the entire procedure. The addition of fluoride remineralises the tooth surface assisting in reducing sensitivity. Minimizing sensitivity and maximizing your comfort. Ensures the full release of the hydrogen peroxide resulting in fantastic results, in minimal time without jeopardising patient comfort. 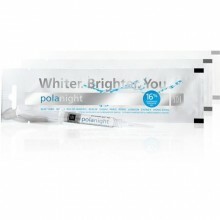 Pola has developed a large range of teeth whitening gel concentrations and formulations allowing us to tailor your whitening protocol to give you the best whitening result possible. These are available for purchase via our online store. After your consultation, we will advise you of the type of gel concentration and the period of time you will need to wear your home teeth whitening trays. In most instances home trays are worn for a period of 2 – 4 weeks, however this will vary depending on each individual case.